Saturday was a nice cloudy day with some soft rain. It was a good day to fire up the oven and try a recipe I picked up from the “Savor the Southwest” blog written by friends in Tucson. The blog is shared by a group of devotees of native plant foods and recipes. 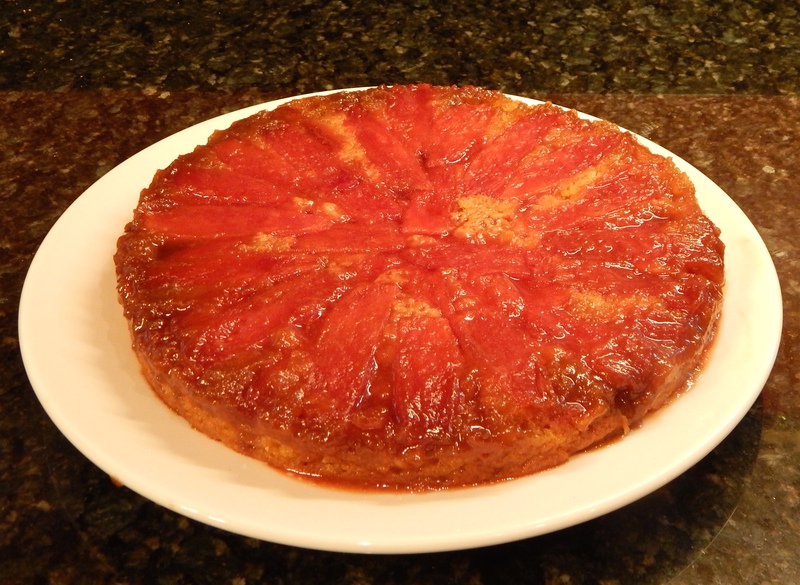 I regularly enjoy the blog and was excited to find a Prickly Pear Upsidedown Cake recipe a few weeks ago. Prickly pear fruit (called tunas) are in season. I find them in a couple of the stores here from August through October. I like to buy rather than harvest because they are grown for the market and already have 99.999% of the glochids (tiny barbs) removed. I do manage to sometimes find that .001% barb that got missed in processing. I washed a dozen tunas and juiced 6 of them to get 3/4 cup of juice for the recipe. 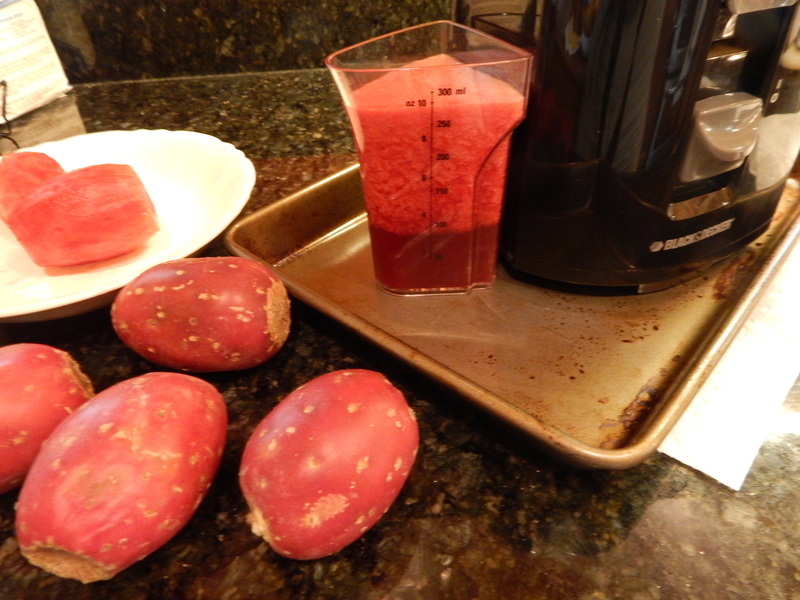 I have a small juicer that handles about one tuna at a time, but it is still much easier and faster than using the blender and a strainer as I did the first time I juiced tunas. Whole tunas, tunas in the bowl with ends trimmed go in the machine. The juice separates in the catch jar. It is thick and mucilaginous but it separates into a beautiful magenta liquid and a cloudy layer that can be spooned off and strained. 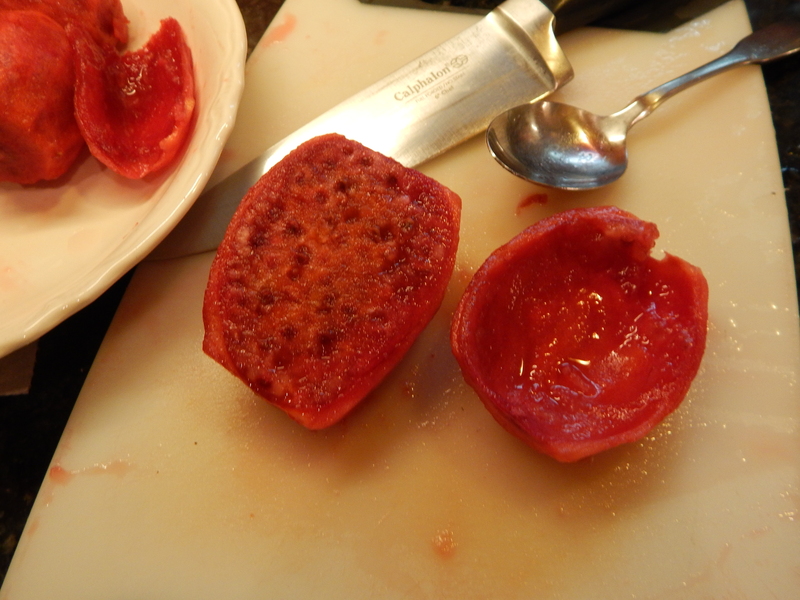 After juicing, I peeled the remaining tunas, sliced them in half and removed the seed. I saved the pulp and seed to enjoy as a chef’s reward for my labor. They were sweet and delicious. The seed are harmless if swallowed, but are very hard if you should happen to bite down on one. Tuna, peeled and halved. One half has been seeded, the other has yet to be done. After mixing the dry ingredients and the wet ingredients separately, I prepared a springform pan by melting butter and sprinkling brown sugar over it. Then, I added the sliced tunas to the pan, combined the wet and dry ingredients into a batter and pour it in the pan. Of course there is bound to be a little leakage from the pan, so I used a baking sheet under it before it went into the oven. 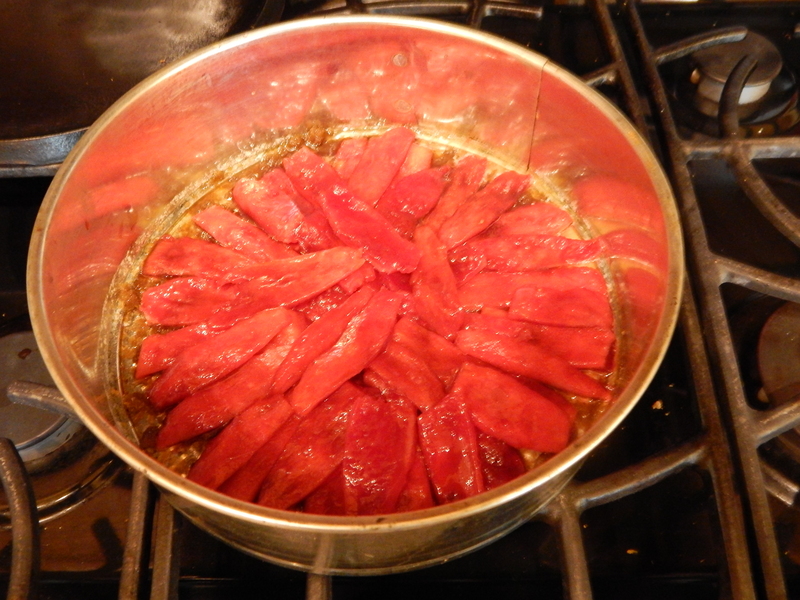 Prickly pear tunas in the springform pan ready for the batter and baking. The cooking brown sugar and butter smelled so good I could hardly wait for the cake to get done and cool so I could turn it out of the pan. The kitchen santos did it again! 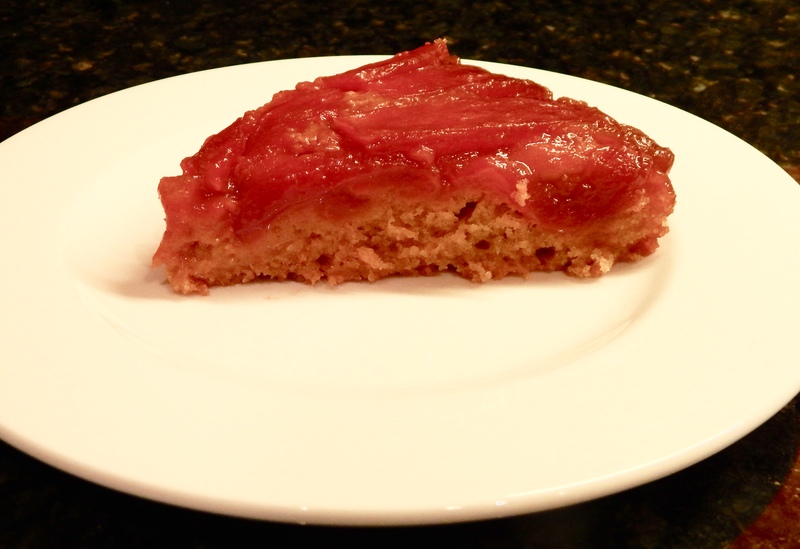 The cake turned out nicely revealing the prickly pear tuna top and nicely browned cake. Served up and ready for tasting! We enjoyed the cactus cake very much. The whole wheat flour and the sweet tunas and brown sugar were complementary flavors making it especially good. Working the tunas is a bit labor intensive, but worth it in the end. Singe clochids (tiny barbs) over fire from 6 prickly pear fruit. Peel, seed and slice fruit. I prefer to buy tunas that have already been cleaned of glochids. Juice 6 tunas to yield 3/4 C. They may be juiced in a juicer or liquified in a blender and strained. Good news! The juice does not stain clothing or kitchen towels. Preheat oven to 325°. Put 1/4 C butter, in a 9 inch springform pan and heat in the oven just until the butter is melted. I recommend putting the pan on a baking sheet in case the springform pan leaks a little butter. Sprinkle brown sugar evenly over butter and arrange sliced fruit in pan. Mix dry ingredients. Mix juice, melted butter and vanilla. Combine and mix well into a smooth batter. Pour over prickly pear fruit in the prepared pan. Bake for 30 minutes or so until a toothpick inserted into the cake comes out clean. It may take a little longer to cook because the pan is on a baking sheet. Let the cake cool thoroughly in the pan, invert onto a serving plate and savor the treat! I’m using my new kitchen every day and someday, I’ll get totally moved in. 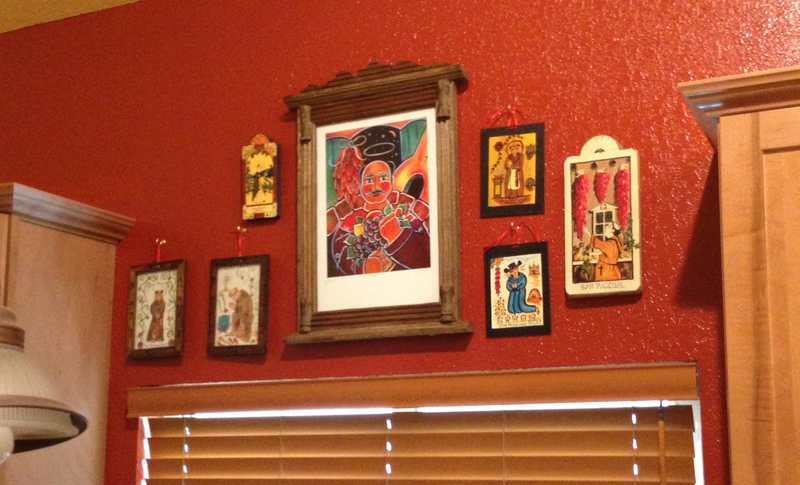 Yesterday, I hung a collection of santos to watch over me when I cook. Six San Pascuals (patron saint of gringo cooks in Santa Fe and at least one in El Paso) and one San Vicente (patron saint of wine, wineries and vintners) should take great care of cooking in this kitchen. I gave the santos a workout last night. They blessed my experiment with a new dish – a pork loin crusted with a paste of whole grain dijon mustard, fresh rosemary, lemon zest and garlic. 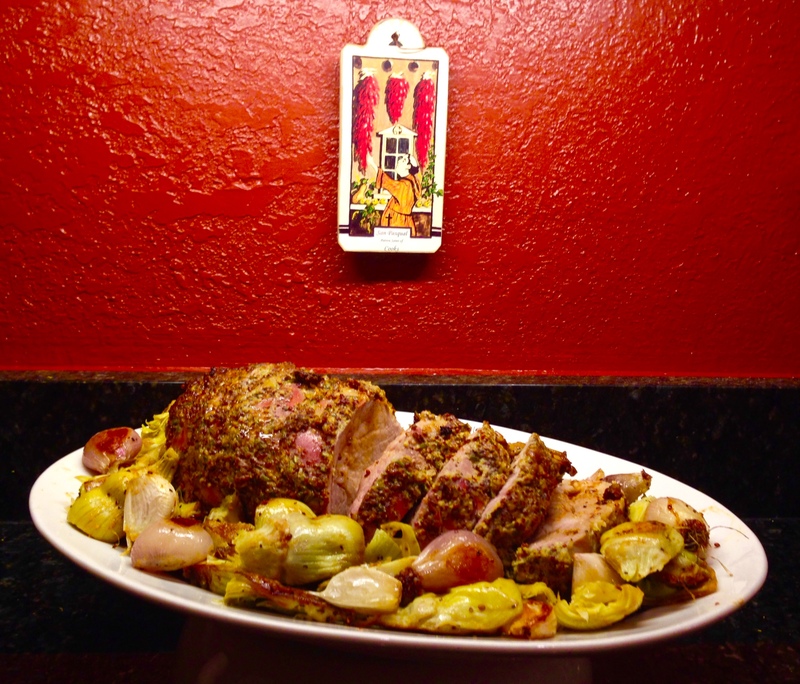 The loin was roasted with artichokes, shallots and unpeeled garlic cloves. After cooking, the garlic cloves were squeezed from their skins onto the sliced roast for another layer of flavor. A pan sauce of drippings and a reduction of chardonnay and chicken broth was drizzled over the roast and vegetables. The result was amazing thanks to the santos watching over the prep and cooking. Thank you, San Pascual and San Vicente for your watchful help in my kitchen. 18 baby artichokes if you can find them. I used two cans of quartered artichokes packed in water, thoroughly rinsed and patted dry. Grind lemon zest, peeled garlic cloves and chopped rosemary to a paste in a mortar with a pestle or use a mini-food chopper which is much easier! I added about a teaspoon of olive oil to help manipulate the mix in the chopper. Add mustard and mix until well blended. Trim and cook your artichokes in water with juice of the lemon you tested. If using canned, drain, rinse and pat dry trying not to break them up too much. Place the artichokes, unpeeled garlic cloves and peeled shallots in a medium bowl, add olive oil, salt and pepper, toss to coat and set aside. Spray a small (13X9X2) roasting pan with non-stick spray. Place pork, fat side up, in pan and coat with mustard/rosemary paste on top and sides. Let marinate on the counter for at least 30 minutes. I let mine sit for an hour to be sure the roast was up to room temperature. Preheat oven to 450°F. Roast pork until crust begins to brown – 20 – 25 minutes. Reduce heat to 350°. Arrange artichokes, shallots and garlic around the roast and return the roaster to the oven. Roast until an instant-read thermometer reads 145° – 150° and vegetables are tender – 45 minutes or a little longer. Transfer roast to a work surface, tent with foil and let rest at least 15 minutes. Move vegetables to a bowl and cover to keep warm. Place roasting pan directly on stovetop over medium-high heat and add the vermouth or dry wine scraping up any browned bits from the bottom of the pan. Simmer until reduced to 1/4 cup, then add chicken broth and reduce to a scant 1/2 cup. Season with salt and pepper to taste. Cut pork into 3/4 inch slices and arrange on platter. Spoon vegetables around pork. I drizzled the pan sauce on the pork slices and vegetables. You may pass the size alongside if you wish.